In today’s consumerist society, where we think that foraging for food means a trip to the supermarket and that being environmentally responsible means putting our garbage in the correct recycling bin, it’s hard to imagine that, in the not too distant past, our ancestors not only lived off the land, they lived in harmony with the land and they put as much back in as they took out. It might also surprise you to learn that some people are living the same type of sustainable lifestyle today. Permaculture is a detailed framework for sustainable living and it can be put to good use in your own back yard just as well as it can in a dedicated permaculture community like Rak Tamachat. Permaculture takes a good, long, hard look at how we use resources, such as food, energy, shelter, and how we cater for our material and non-material needs. Then, it looks at how we can meet those needs in a way that benefits both ourselves and the environment. Permaculture is not some kind of sect or religion. It is a way to get more out of life for less and, by doing so, create benefits for the environment and for future generations. This practice of sound living can be applied anywhere, if you know how. People are applying permaculture principles to their lives in towns and cities around the world, as well as in permaculture farms like Rak Tamachat. Permaculture is, in essence, the framework for an ecologically sound way of living. Rak Tamachat, which means “Love Natural” in Thai, is a permaculture farm, located in rural Northeast Thailand. The farm consists of 75 acres of land on which 13 full time community members, along with guests and students, live holistically, practicing broad scale permaculture. Life on the Rak Tamachat is not all hard graft; the community makes a point of stressing that if life isn’t fun and fulfilling, then you are doing something wrong. The community lives in natural buildings, grow their own food without the aid of chemicals, and they return what they can to the environment by recycling waste and water and by using composting toilets. 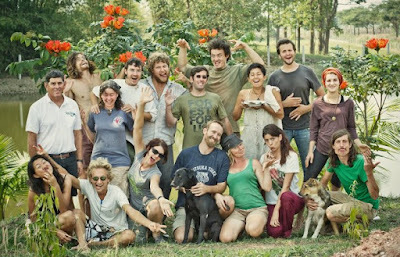 In fact, living on a permaculture farm is not at all about hardship at all, it’s about enjoying life in an ecologically sound way. The good news is that if you want to experience the Rak Tamachat way of life and you want to learn more about how to use permaculture to enhance your own life, you can visit Rak Tamachat for a 17 day environmental sustainability course on which you will learn the basics of permaculture design and natural building. The combined permaculture design course (PDC) and natural building course teaches students all they will need to create a permaculture master plan and how to build a natural building of their own. The course is hands-on as well as classroom based, so students learn through experience while they get to enjoy the communal living experience at the farm. Whether you come away from a course at Rak Tamachat more environmentally aware, or you take away what you learned and you apply it wholeheartedly to your own life, is totally up to you, but for many people, a stay at the Rak Tamachat permaculture farm is a life changing experience that they never forget. If you’d like to know more about how permaculture can help us all to live more sustainably, see Raktamachat's environmental sustainability courses for more details.